Do You Feel How You Eat? The broiled fish filet with steamed broccoli and rice you had for dinner last night and the salad you opted for over the hamburger at lunch yesterday may be doing more for you than just keeping your waistline in check. It may be giving your mental health a boost as well. Medical researchers have long known that people who are depressed tend to eat greater quantities of fast food. New research suggests, however, that by simply changing their diet, depressed individuals may be able to improve their mood. Through a study using 67 participants who had either been prescribed antidepressants or were attending regular psychotherapy sessions, the researchers at Deakin University’s Food and Mood Centre discovered what may be a new link between food and mood. When the three-month study began, the diet of each of the subjects involved was virtually void of dietary fiber, fresh meats or vegetables and consisted almost exclusively of processed fast foods and sugary or salty snacks. During the study, half of the subjects were allowed to continue eating as they were before the trial began while the other half were given diets made up exclusively of lean proteins such as grass-fed beef, fish, fresh vegetables, eggs and nuts. All of the subjects’ depression levels were tested both before and after the trial began, and what the researchers found was that among those who ate healthier during the 12-week study, the scores improved by an average of 11 points. In addition, nearly a third of the 33 individuals in the intervention group recorded scores so low they were deemed to be in remission. As for those who continued to eat normally, only 8 percent achieved remission while depression scores on average rose just 4 points. 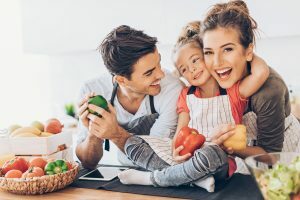 While the study is hardly definitive, it suggests that any individual suffering from major depression could improve his or her mood simply by eating a healthier diet, which will likely result in better overall physical health as well. All of this does, of course, fall under the category of easier said than done. After all, it is well known that when people are depressed, they often have a tendency to reach for comfort foods that they hope will lighten their moods. It’s doubtful, though, that a bowl of ice cream or a box of chocolates will actually make anyone feel better. It’s quite possible, though, that by substituting a handful of grapes or some nuts and raisins for the ice cream or candy will make you feel better. Some other eating tips that might help swing your mood in a more positive direction include eating a health breakfast; eating foods high in Omega-3 fatty acids such as fatty fish and walnuts and consuming at least 600 international units of Vitamin D per day.